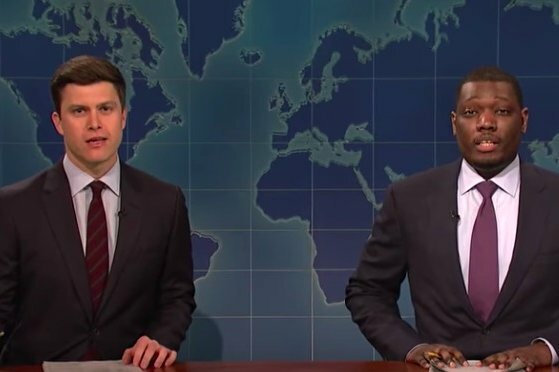 Colin Jost and Michael Che at the Weekend Update desk on "Saturday Night Live." A new season of "Saturday Night Live" returns Sept. 29, and though we're still waiting to find out who the first host and musical guest will be, we do know that "Weekend Update" co-hosts Michael Che and Colin Jost will be returning as head writers. NBC announced Che and Jost, who have been anchoring "Weekend Update" since 2014, will return as co-head writers for the second season. Kent Sublette will also return as a co-head writer for the upcoming 44th season. Sublette has been doing the job since the 2016-17 season. Bryan Tucker, who has been with the show for more than a decade, will step down to a senior writing role after being a co-head writer since the 2014-15 season. You might be familiar with his work from when he helped create the show's Serial podcast parody in 2013. As for the cast, we typically expect to see some new faces every year, but no new performers have been announced. We do know, however, that show has parted ways with Luke Null, who was a new featured player last season, hired alongside Chris Redd and Heidi Garner. Over the weekend "SNL" received seven awards at the Creative Arts Emmy Awards, including best original music and lyrics for "Come Back, Barack," starring Redd, Kenan Thompson, and Chance the Rapper. Tiffany Haddish also won an Emmy for her stint hosting "SNL" last November. The show is up for 11 more awards at the Primetime Emmys. Che and Jost are co-hosting the ceremony, which airs Monday, Sept. 17 on NBC.